In a time when in Paris Marine Le Pen is “Ante Portas”, when xenophobic populists are marching through the streets of Dresden, when in London the UKIP sets the tone for an ever more Anti-European hysteria, and when in Helsinki the Finnish government becomes the most ardent proponent of more austerity for Greece, for no other reason but the fear of a success of the “real Finns” at the next ballot box, the Greek people have given a clear signal, voting against more austerity and for the European values of democracy, the welfare state, tolerance and inclusive societies. They have rejected the ruling by European and international technocrats. They have said no to their national oligarchic establishment that has led the country to the current situation. But they also resisted the Siren calls of Golden Dawn. They have given their confidence to an untested party, with no experience in government, a party that has presented an electoral programme proposing better governance, more democracy, greater social justice and an end of austerity policies that have destroyed the economy and created unprecedented hardship while the public debt (and the private one) continued to increase. The Greek voters have sent a clear message to the rest of Europe: they want to be part of Europe, they can’t bear more austerity; they need a sustainable solution to their debt problem; they want to be a respected partner in the European Union and play an active role in the common search for a Greek and European recovery. Europe should not see the victory of Syriza as a threat. Instead, it should be seen as a clear signal from the people and as an opportunity for Europe as a whole to reconsider its crisis response, which has already lead the continent into what may become a decade of deflationary stagnation, even with the last intervention of the ECB. There is no easy solution to the deep crisis in Europe but one thing is certain: to continue with policies that do not work, because they concentrate exclusively on fiscal prudence, is the opposite of what must be done, in giving priority to growth, investment, employment and redistributive policies. Anyone guided by realism will recognise that Greece cannot at the same time serve its tremendous debt burden and recover economically and socially. Insisting on servicing the debt, without a strong economic recovery might be popular in some European capitals but it will just not work. Debts that cannot be paid remain un-payable even if creditors continue to insist that it should be paid. The debt crises in Germany in the last century offer great lessons in this respect. After World War I, the victorious powers insisted that Germany should pay reparations independently of its economic performance. The results are well known: Hyperinflation in the twenties, brutal austerity in the early thirties resulting in the rise of Hitler who immediately stopped servicing any foreign debt when he came to power. After World War II, the Allies recognised that Germany had to become prosperous first and should pay afterwards. That reasoning lies behind one of the most generous debt restructuring agreements in history in 1953, when more than 50 % of the German debt was written off, repayment was stretched out over more than half a century and debt payments were made conditional on the existence of a trade surplus. The last payment of debt from World War I was actually made as late as in 2010 and payments at no time exceeded 5% of German export earnings. In many European countries the public debate on the debt crisis is also framed in moral terms. Many claim that Greece had cheated when entering the Eurozone, that they are free-riding on hard-working Northern Europeans, that they need to be taught a lesson in order to learn financial responsibility, etc. The judgements should not be about “Crime and Punishment” but about economic viability and a better future. If debt restructuring had been guided by any moral reasoning in 1953 it would have certainly been extremely difficult to make the case for German debt relief. But it was economically, politically and socially the right thing to do and it paid off not only for Germany but for Europe as a whole. Greece's 317 billion Euro debt today is in absolute terms 13 billion less than five years ago but due to the economic collapse it nevertheless rose from 113 to 175 % of GDP. Any assumption that this debt can be served without growth is illusionary. This must be recognised by all those interested in a solution and be the realistic starting point for renegotiating the debt. As long as capitalism exists there has not been a boom that did not end in a crisis and not a crisis that wasn’t followed by a recovery. Policies should reduce the severity of the crisis and increase the speed of the recovery. Austerity has failed on both accounts but nevertheless it looks that, by a number of indicators, the crisis in Greece has finally bottomed out and, with the right policies of debt restructuring and of productive public investment, there is a reasonable chance for a strong recovery. Bringing down unemployment and increasing revenues has to be a priority over debt repayment. The required economic growth will not come from any rapid rise in private sector investment as long as the risk of unsustainable debt and default remains. Therefore the solution to the Greek problem should start with a solution to the debt situation, a strong public investment programme leading to the creation of more and better jobs. Researchers from the Levy Economics Institute in New York who, in cooperation with the Labour Institute of the General Confederation of Greek Workers, regularly publish a strategic analysis of the Greek economy have calculated the economic impact of a moderate public investment programme of 6.6 billion Euro per annum funded by the EU complimented by a debt moratorium until the country returns to the real GDP level of 2010. 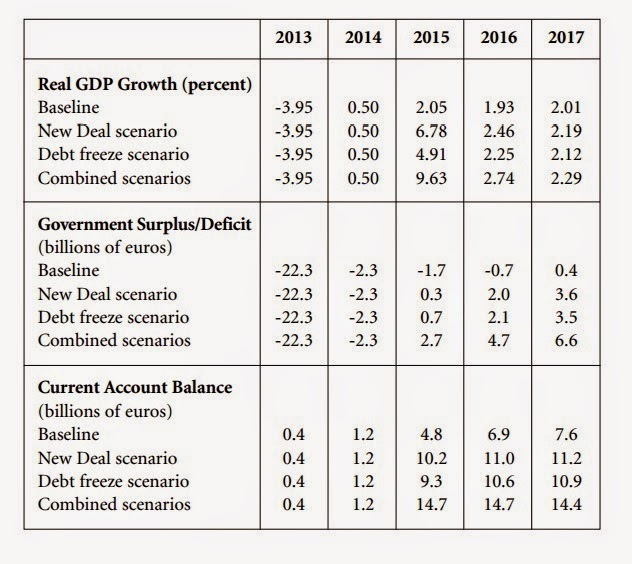 While this would certainly not solve Greece’s problems over night, it would set Greece on a much higher growth path than continuing the current policies (see the baseline scenario in the graph below). Debt restructuring and public investment alone will not solve the Greek problem but there will be no solution without it. Improving the public administration, creating an efficient and fair tax system, fighting corruption, curtailing oligarchic power, rationalising pension systems, improving access to credit, improving the functioning of education, health and social protection systems and creating the conditions for job creation are some of the important elements in a comprehensive recovery strategy. However, some of these structural changes take time and have more long-term effects, while others can boost recovery more quickly. A government of new faces is better positioned to implement such a programme. These structural reforms have bigger chances of success if done in parallel with economic recovery, job creation and growth and not during a continued depression. New faces have also a better chance to re-energize the society and to put an end to vested interests that so far remain largely untouched. Strengthening institutions, including those that are responsible for social dialogue and collective bargaining, and improving the participation of citizens are essential for (re)-building trust in the state and political decision making. The mistake of dismantling the industrial relations and collective bargaining system must be quickly and seriously addressed in order to achieve better labour market conditions, more quality and equality in employment and a fairer income distribution. The challenges Greece is facing are more extreme than in any other European country but they are not unique. Throughout southern Europe the policies of fiscal austerity, no public investment and wage repression have led to a deflationary stagnation with unacceptable levels of unemployment and an increase in inequalities. Pumping billions of Euros at close to zero interest rates into the private banking sector has failed to trigger private real investment and has not reached the real economy. It was more successful in raising asset prices than employment levels. As millions of people are unemployed and many governments can borrow at historically low interest rates, the case for large scale investment in public infrastructure and networks, in education, research and development at a European level is compelling. European and international institutions have argued for six years that there is no alternative to austerity and that the Greek people will pay dearly if they abandon the policy prescription of the Troika. In the spirit of Franklin Roosevelt, the Greek people decided that “We have nothing to fear but fear itself” and put more trust into an alternative, sometimes expressing contradictory ideas, rather than to continue with the trotted path of failure. They have raised expectations and deserve the credit of the doubt and the support from those interested in a change of policies in Europe. The Greek people must be thanked for putting the need for changing the course of economic policies firmly on the European agenda. The stakes are high. A failure in Greece will be seen as vindication of austerity as the only option. It will have negative repercussions for any progressive alternative throughout Europe. Those convinced that Europe needs to change cannot sit on the fence, but need to engage in support of the new winds of reform. Maria Helena dos Santos André is the Director of the ILO Bureau for Workers' Activities and a former Minister of Labour of Portugal. She writes in her personal capacity. Excellent piece and I have shared it in my networks. That's the real story. Period. Excelent as always .